Steve Jobs tried his best to defend iPhone 4 antenna issue in the special press conference which was held on July 15 by comparing it with some of the other popular handsets having the same problem but this apparently hasn’t gone too well with these companies. They believe that Apple in an effort to clear its own mess has dragged others in to the issue unnecessarily. And so as a result, the recent Samsung Galaxy S ad may just be the beginning of yet another anti-Apple advertising campaign. Samsung in its new ad simply says “Hello”, showing full signal bars in place of two “L’s” which of course is targeted towards iPhone 4 “death grip” issue. I personally will never buy another phone except for an iPhone. I have been very satisfied with my 1G-4G. No antenna issues with my 4G at all.. Still the best product on the market, bar none. But to be fair, do I think the Android Market is good, its coming along, and I think it has the potential be as good as the iPhone. I am just glad for the first time in many years I have seen competition and innovation in these products. Between HTC, and Apple, its amazing to see what they produce, and I look forward to the future. Sorry Jared but there is NO 4G iPhone. my friend just got a galaxy s.
firstly i must say the display is beautiful, although i have not yet seen retina display. I played with it for 15 minutes and was like 'uh…ok' that's it? He asked me to find apps for his phone as he doesn't read english. I couldnt really find anything at all even worth downloading. there is barely any decent games available. it was just app after app of junk. and why they decided not to put a camera flash is beyond me. I was quite interested in this phone and I am glad i got to test one out. I think i would even prefer a 3gs over this phone. Hahahaha! Hey, look at this! If I put a Droid X in a vice and squeeze it until the screen pops, it too loses signal. If not, I'll stand in a bunker and photoshop the vid. And if Steve Jobs to took his head and the heads of all the iP4 fanboys out of his axe, he'd feel better immediately. They have no choice buy to resort to things like this in order to compete. Apple was merely trying to let people know that signal strength can vary on other phones too when held and the issue is not specific to iPhone. Did you not see his “1G-4G” statement? A lot of people, including myself call phones via their generation. The iPhone 4 is the 4th Generation. I love idiotic comments like yours though. I have a 3G, 3GS and iphone 4 but totally agreed with Samsung on this one. Apple should take care of problem on their own instead of bring someone else in. You got to be kidding that samsung can make jokes with anyone, such a rubbish phone. You can't blame them for trying anything possible to hurt apple sales. Problem is apple has the best phones available and the best design. 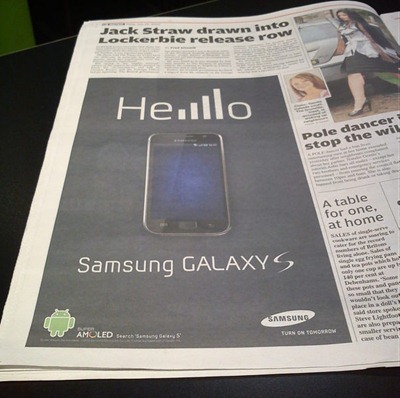 And who wants a phone with SAMSUNG in giant letters across the top? That phone would have looked nicer if they would have put the name on the back only. All well still a cheap knock off of the iPhone. I'm more interested about the pole dancer story. Very funny but Samsung should look at its own problems first. The Galaxy S has serious problems with GPS reception and accuracy. Several firmware versions after the release and it is still quite useless. A shame, shame… might be the Broadcom chipset or even firmware but right now the GPS is a mess. he means 4th generation artard…. 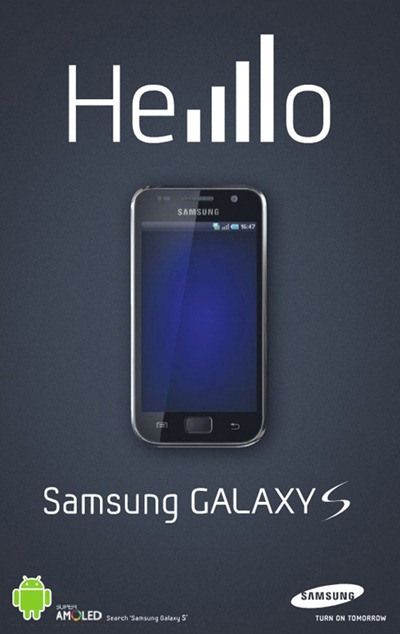 dont get me wrong the iphone is good but so is the samsung…. no gps problems either. Can't comment on games – I never use them. Other apps? Well, I've had a Galaxy for about two weeks and I love it. Apps wise, I'm not sure what iPhones have that Androids don't – help me out here. USEFUL iPhone apps for iPhones and Androids are in the hundreds. everything after that is either niche or crap. Any new ideas for apps are quickly duplicated by the other side (whichever that way may be). No, the morons are people making up their own names. Since there are 3G and 4G ACTUAL names for cell technologies, it makes sense to not use those in self described names of phones. He is correct, there is no iPhone 4G. Hell, if anything, the 3GS would have been the 4th generation. You’re probably the same idiots that think there’s an iPod Touch 3G. Even Apple says the latest Touches are NOT 3rg generation, they are the 2nd release on the 2nd generation (MC models). So Georgae and Tlynn23, YOu are the moron atards.